It has been weeks since my pre-internship at Campbell Collegiate has been done, and I finally feel like I have the chance to reflect on a great experience. I was able to try many things while working at Campbell, the most exciting thing being a cell phone math lesson. I have felt a lot like doing all the research I have done over the last semester has made me feel confident in using a tool like cell phones in the classroom, except I hadn’t really had an opportunity to try it and see what it was actually like. From day one at Campbell I knew that I could use the cell phones. Looking at the classroom it is easy to see how crucial students feel cell phones are in their life. Almost every single student used the phone instead of a calculator and it was nice to see that the teacher was alright with this. You can tell when the students are actually using them as calculators and when they are texting or doing something off task. 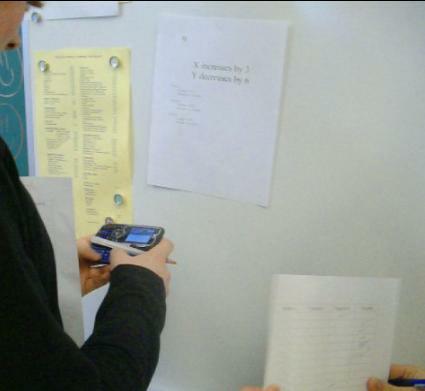 At first I thought that most students would be texting, but I found that most of them were only using their phones when they needed to make a calculation. I turned to cell phones when I didn’t have anything to plan. I was supposed to be introducing slope, but my partner and I switched classes for the last week so I was without the textbook or anything that was supposed to be planned for the unit. 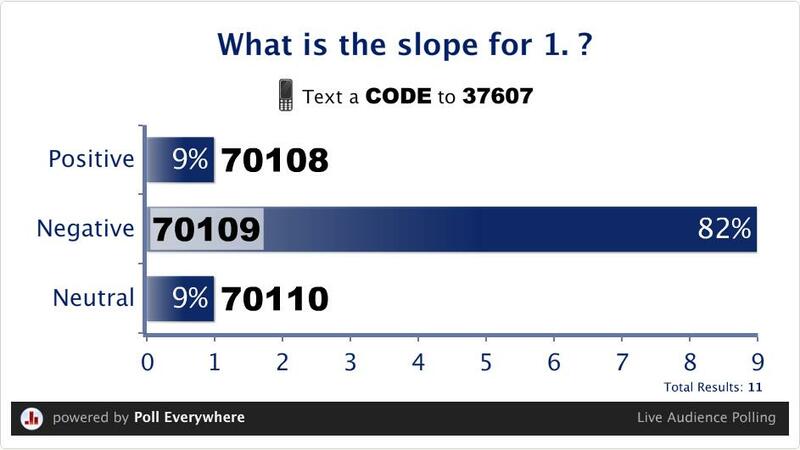 The unit they were working on was slope. It was a perfect unit for me to work with the kids with because I had just went over rate of change with them so it was easy to make the transition. I started my lesson off with a guided inquiry handout that I had the students work on their own with to discover slope, which also turned into their notes for that section, then had them do a journal on what they thought slope was. I then did a quick overview of what slope was and described to the students what positive, negative, and neutral slopes were. My lecture time didn’t last very long. As soon as I asked the students to pull out their phones they thought it was a joke. Once I convinced them we were using them, they became much more excited. What I had prepared was ten stations (which I have below) that they could decide if the slope was positive, negative or neutral. 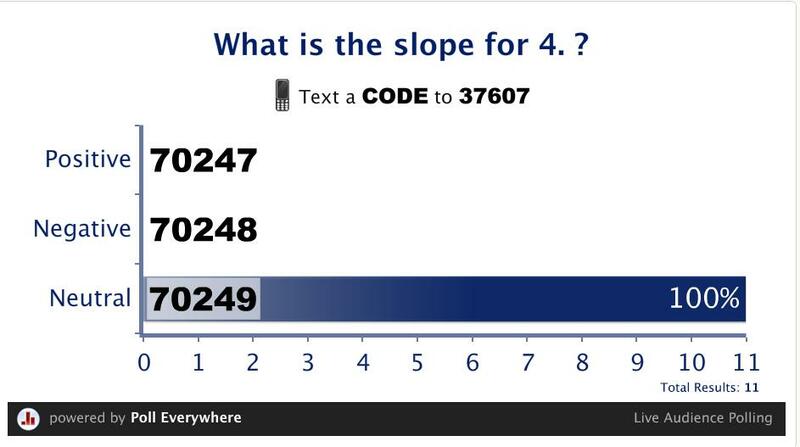 It described slope in multiple different ways like a graph, points and in words. I used the website called Poll Everywhere. What this did was create a poll that the students could decide whether they thought each station was positive, negative, or neutral and then they texted that number and answered the question. Many students, because we hadn’t done anything like this before, were confused why they were texting the number because they didn’t get a text back, but this was easily cleared up at the end of the lesson. The students worked quickly through the stations and were 100 percent engaged. Some of the students who have trouble focusing on an assignment for the whole class got through the questions quickly and on their own. I was a little worried that some of the students were just walking around guessing, but this wasn’t the case. Once everyone had time to go to all of the stations, i brought up the completed polls on the board. This was beneficial in multiple ways. Not only did the students get to see if they got the answer right, but I also got to assess as well. I could see which problems the students had difficulties with and if they understood the concept. In the above poll there was differences in the answers, so I could go over it instantly as a class to see where some of them were going wrong. As we went along through the stations they got more consistent and 100% of the class was answering the question correctly. The most interesting part of this was the students reactions (I have a video I just can’ t put it online). They started getting excited each time I went to show them the answer. I had them do a written copy of the stations so they knew what they had answered for each question, so before I showed them the poll I asked them what they thought it was going to be. At around five questions in they started clapping for themselves, and on the last ones they were cheering. It was amazing to see them get so excited over their math assignment. There was a moment that really stuck out where a girl congratulated everyone after they got the question right, and I was just very proud of the students at that exact moment. I was a little worried that my assignment had no connections to what they needed to have done for their teacher (aka the text) so I looked at the questions. Each station covered every type of question that was in the assignment so I assigned them some questions that they did very easily. Of course this assignment could be done without cell phones, but I think it would lose the engagement. The class responded really well to this assignment, but obviously many other classes wouldn’t. It was a really nice way to work in some cell phone use in the classroom and see how it went over. I could have easily used a QR code with this making it that much easier for the students. There is a generator that will send a text when you scan the code, so I could have had them just scan the code and click send for their decision. 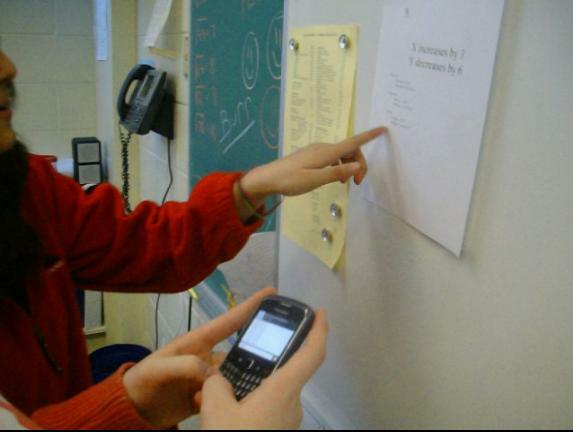 Using the cell phones has really shown me that there is a need to incorporate the technology that appeals to the students. The technology component of the curriculum requires so much more than just graphing calculators now, and as educators we need to find ways to use these different technologies effectively. I can see that cell phones are important now and it is great to find ways to use them, but I can also see that it is going to change and adapt even more. Technology is quick, and it replaces itself so quickly, what works right now isn’t necessarily what will work in the near future. I feel the need to be very on the ball with these things because once I feel like I have perfected the use of one technology it is probably going to be out dated. For now, since I am not in my own class, I just need to try to think about the different ways to incorporate technology, and be aware of how it is changing. EPS 350 required us to make a documentary of our growth over this last semester. I created this video called A History Of A Teacher. It is my reflection on what I have done for this semester. Of course, I had to edit out a majority (basically all) of my actual experiences because there were students in the clips or pictures. What is left is basically the introduction and conclusion. I wanted to try and do something different… so I guess you just have to watch it to understand what I mean.. yes I am a huge dork. The intro has more of my own reflection on how teaching has developed before I even got a chance to be involved. So I hope you enjoy! I learned a lot doing this assignment. Mainly that editing video drives me nuts. It’s a really cool process and fun to work with, but since I had basically no video editing experience whatsoever there were a lot of frustrations. I got it to look how I want it to, mostly… I used Windows Movie Maker, I wish I could try using some different programs. During pre-internship I learned a lot of things about myself. I found that my expectations of myself, going into the experience, were very high, which probably forced me to try and do more each day. Some of my ideas of what I thought education was changed, and others were reinforced. I got to experience teachers out in the field and see many things that I like, but more likely than that was seeing thing that I didn’t like. My main focus for this field placement was assessment. I really wanted to try and actually do some assessing because this has been the real first chance I have got to do it. I wanted to over do it, if anything, since we were only there for a short period of time. I tried many different things like exit slips, entrance slips, anecdotal notes, observation, assignments, homework, quizzes, tests, projects and probably even more. Each day I tried to make note of the assessing I planned to do as well as what I thought I had actually accomplished. I made a detailed log on my online learning portfolio . Not only did I try to vary my assessment tools, but I tried varying my teaching strategies as well. Since my EMTH class researched using different online things, I tried hard to incorporate two of the strategies. I made a What Can You Do With This video and used that as a point of inquiry with my math nines, as well I did a cell phone activity with my math tens. Finally, after all that research, I was able to put it in action and actually see first hand how students responded to the strategy. I tried a bunch of different inquiry lessons and the more I did the more successful they become. My students were not used to any variance in their teaching so I had to make them comfortable first and create a better risk free environment for them. I found myself trying to differentiate a lot. There was a student with Aspbergers in my class, as well as FASD, and those were the things I was told about. I made separate lessons for them to work on, that appealed to them better, as well as made extensions for my higher level students. I taught all my lessons in a way that was meant to be understood by all and I was very conscious of everything I said and did. I had created a series of arm signals that the students new to show their understanding. Some days I tried a little two hard with some of my lessons. I think that my greatest weakness from this experience is that I really need to plan everything through. There are lots of changes to my lessons that I could have avoided if I just spent a little bit more time critically thinking about them. I had two difficult classes for classroom management, which I think I handled well most days, but this was also another thing to improve on greatly. I need to vary my techniques on how I handle a class and become more familiar and comfortable using these different ways. I am also worried about bullying. I actually witnessed some minor bullying, and was able to stop it for the time being, but I am overwhelmed with not knowing how to handle it. I have no clue! I used to think I knew how to handle some of these things but now that I am actually in the school setting I am very worried I won’t actually know when the opportunity presents itself. I learned so much from the experience, and was lucky to have a co-op who let me try everything I wanted to try. I was able to go into some extra-curricular settings as well and get a feel for that. My main focus for the future, now, is knowing that I have to be constantly thinking about what I’m doing and if I can do that and continue to build on my teaching, I feel like I will be become more of a teacher. Throughout the semester I have been keeping track of my professional growth on my blog. Specifically for my EMTH 350 class, I have been putting a lot of my assignments on here. Last night I decided it looked very unorganized so I made it into it’s own separate blog: EMTH 350 Portfolio. This is a parable about assessment. It compares what we are learning in school to how tall a person grows. This is a powerful comparison since a person really can’t control how much they grow, just like a person really can’t control how they learn. In the parable, as they come across problems with behaviour they need to assess how they are grading the students, so they call in a wise woman. This wise woman says to plant smaller trees and provide ladders. This is where we can make the connection with differentiated instruction and providing students with the tools they need to do the most and the best they can do. This ties in to all of the differentiated instruction we talk about and knowing that not every student is the same and the way we teach them can’t be the same. The people in the parable have difficulty with the fact that they can’t grade a person the same way if they are climbing different tree’s or if they are using ladders. The wise woman says, what are we wanting? To grade or to pick the fruit? This is the big question and comes back to thoughts I have been having so much lately about assessment. What is a grade? The point of this parable is to put it into simple terms to show that it is so obvious that focusing on a grade isn’t the important thing. Focusing on the learning achieved by the student is the most important thing, and there are ways to assess if they can accomplish that without having a standardized grade that is used to compare all students. Schools focus on the grade. It is the way they are structured and how they are geared towards post secondary education. The fact is that it is competitive, there are scholarships that students are competing for, and for that post secondary aspect they are looked at. The reality is that many students aren’t going to post secondary, and so if our instruction is geared towards that top 7% that we always hear about, what about the other 93%? Assessment in this form is focusing solely on the end product. This doesn’t really demonstrate the actual growth that a person goes through. This is similar to the assessment I have faced in school, I haven’t ever really been assessed in other ways besides tests. A big focus for my teaching is recognizing the assessment that I am doing within my instruction, and making sure there is ongoing assessment. Like in the parable we need to “plant pink fruit trees” and change what it is we are focusing on which is most beneficial for students. What Makes A Good Math Student? Why are some students more successful than others? What does it take to be a successful math student? This is the question that has been posed to us through our EMTH 350 class, and the answer has come down to two things: reading, and pattern recognition. If a student is having trouble reading a problem, and comprehending that information, they aren’t going to be able to do the math part either. It is the first step when solving a problem. It makes sense, then, that we teach literacy in mathematics. How does this look? Emphasizing literacy in mathematics will work on the literacy skills and continue to strengthen those skills. The stronger the skill, the more everyone will be able to understand the problem. Having students read out is a way to strengthen reading skills, rather than reading the questions yourself. Whether it is having everyone in the room read out loud, or an individual, or one on one when a student asks a question, having them read the question will have them understand it better. Going over words that are going to be used in different units is also important, and having a visual to return to when building a vocabulary. We learned about PWIM’s (Picture Word Inductive Model) that can help build vocabulary. Taking a picture of what students see and building on that, and having them come up with their own vocabulary, is a way to promote literacy. Brainstorming and creating own definitions of what words mean is also another way to emphasize certain words and promote that literacy. Sometimes we can take for granted the amount that we are able to understand because we can read. If a student isn’t able to comprehend those language elements, they aren’t going to be able to understand much else. Finding ways to approach this when teaching will help with the understanding of any subject. Math is all about patterns, and being able to see a pattern and formulate an answer. The stronger the pattern recognition skill, the easier math skills will be transferred. In the youngest ages you learn these skills first, from counting, shapes and many other pattern things that are essentially enforcing math skills. Where patters is more to do with mathematics, literacy is for learning in general.